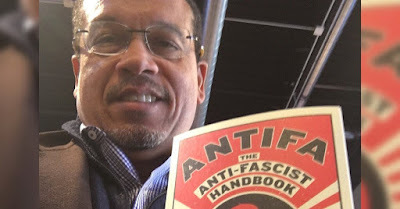 Minnesota Rep. Keith Ellison is drawing criticism for calling attention to a book that critics say condones a left-leaning group using violence in clashes with white supremacists. Ellison, the deputy chairman of the Democratic National Committee, posted a photo on Twitter Wednesday of himself posing with the book "Antifa: The Anti-Fascist Handbook." The book calls violence during counter-protests "a small though vital sliver of anti-fascist activity." Nothing says "guy who's going to enforce the law fairly" like holding up a book that accuses his political opposition of being Nazis, I tell you. I would have hoped that his former Nation of Islam activism, lying about that, and blatant anti-Semitism would be a deal killer for DFL voters, but apparently not. Thank you for this reminder. This wants me want to support Ellison even more. Anyone who is against Trump and his crowd of redneck, white supremacist voters has my vote. If anyone can say with with a straight face that Trump and anyone who voted for him is not a Nazi, they are not living in reality.